Austro- means "south" in Greek, hence the name Austro-Asiatic. 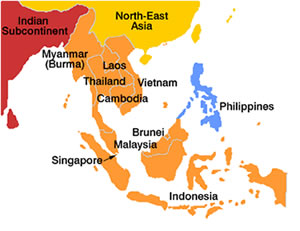 Most of the languages that belong to this family are spoken in Southeast Asia, in countries located between China and Indonesia. A few are spoken to the west of this area in the Nicobar Islands and in India. Over two-thirds of these languages are seriously endangered, on the brink of extinction, or are already extinct. As you can see from the table below, only 24 (14%) of the 168 languages have populations over 50,000, and only three have populations of over 1 million. It is not known where the Austro-Asiatic people who speak these languages came from or when they migrated to this part of the world. It is probable that they came from southern or southeastern China some time between 2,000-2,500 BC, and migrated south into the Indo-Chinese peninsula and west into India. Invasions by speakers of other languages split the Austro-Asiatic languages into several groups. As a result of these invasions, few national states ever developed in the areas where these languages were spoken. The only exceptions were Khmer, Mon, and Vietnamese. The rest of the speakers of Austro-Asiatic languages continue to live in small tribal groups even today. Because of their separation from each other and because these languages were surrounded by other languages that influenced them, they exhibit great diversity. For instance, The Munda branch has been influenced by synthetic, non-tonal Ind0-Aryan languages, the Mon-Khmer branch, on the other hand, was influenced by analytic, tonal languages of China. As a result, the two branches have evolved in different directions which makes the reconstruction of their common ancestor extremely difficult.